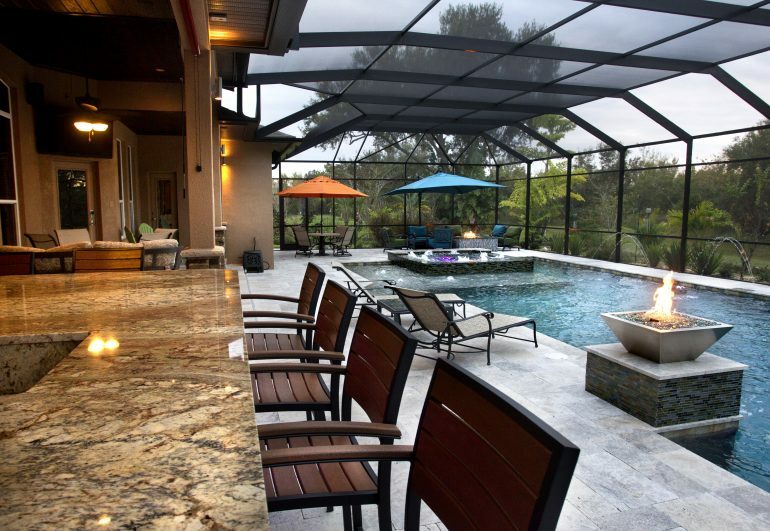 When considering the design of your swimming pool and outdoor living area in Tampa, screen enclosure installation is one of the bigger decisions to be considered. Natural - A pool without a screen enclosure feels more natural and connected to the rest of the back yard. Warmth - A screen keeps some of the sunlight from reaching the pool, so an unheated pool without a screen enclosure will warm up sooner in the spring and stay warmer later in the fall. Lower cost - There is no cost to clean, maintain or repair the screen enclosure. No bugs- A screen enclosure keeps mosquito and biting flies away from you, your family and your guests. If you live near the water or like to spend time outside around sunset, this can be a particularly important benefit. Open doors - During the winter months when the weather is cooler, its nice to open the sliding glass doors in the back of the house and let a breeze blow through the house. With a screen enclosure, you can do this without fear of letting the mosquito in. This can be particularly nice if you host a party both inside and outside the house. Cleaner - A screen enclosure prevents leaves and other debris from getting into your pool, helping it to stay cleaner and reducing the amount of time necessary to clean and maintain it. Cooler - If your swimming pool is in direct sunlight most of the day, in the middle of the summer it can become too warm. A screen enclosure will keep a pool about 5 degrees cooler, which can make a significant difference in how refreshing it is in the hottest part of the year. If you decide you want to add a screen enclosure to your swimming pool or your existing screen enclosure needs to be replaced, consider Grand Vista Pools for your screen enclosure installation. If you already have a screen enclosure that needs some work, consider Grand Vista Pools for your screen enclosure repair.